Hurricane Joaquin covers the Bahamas in this new photo taken Oct. 1 by NOAA's GOES-East satellite. The eye is completely visible, as the storm has now reached Category-3 status. As Hurricane Joaquin barrels across the Atlantic Ocean, NASA satellites are tracking the storm to determine how it will affect residents along the East Coast of the United States. A new video of the hurricane taken by NASA's Global Precipitation Measurement satellite shows a 3D view of how the storm grew and changed on Tuesday (Sept. 29). The animation shows rain rates and cloud heights just before the storm built into a hurricane. 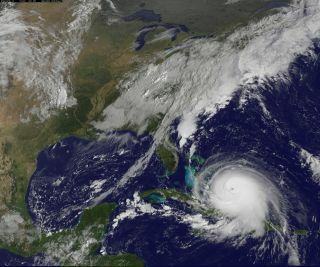 A stunning composite image of Hurricane Joaquin, which is now a category 4 storm. The image was taken at 8 a.m. EDT (1200 GMT) on Thursday, Oct. 1. The infrared data comes from the EUMETSAT weather and climate monitoring satellites. Joaquin was upgraded to a Category 4 storm at 2 p.m. EDT (1800 GMT) today (Oct. 1). The most recent statement from NASA says that "some additional strengthening is possible during the next 24 hours, with some fluctuations in intensity possible Friday night and Saturday." At about 5 p.m. EDT (2100 GMT) today, the National Hurricane Center (NHC), part of the National Weather Service, tweeted a short list of "Key Messages on Hurricane Joaquin." In that tweet, the NHC said, "We are becoming optimistic that the Carolinas and the mid-Atlantic states will avoid the direct effects from Joaquin. However, we cannot yet completely rule out direct impacts along on the east coast and residents there should continue to follow the progress of Joaquin over the next couple of days." The NHC also mentioned that even if Joaquin moves out to sea, it could still create minor coastal flooding. Additional heavy rains not associated with Joaquin are expected to increase the likelihood of flooding in the Atlantic coastal states. This scientific visualization shows a 3D side view of Hurricane Joaquin in action. "Joaquin was moving towards the west-southwest near 5 mph (7 kph), and this motion is expected to continue today," NASA spokesman Rob Gutro of the Goddard Space Flight Center said in a statement today. "NHC noted that a turn toward the west- northwest is forecast tonight (Oct. 1), followed by a turn toward the north and an increase in forward speed on Friday, Oct. 2." On Wednesday (Sept. 30), NASA's Steve Lang at the Goddard Center said in a statement that swells from Joaquin would affect the Bahamas over the next few days, and should reach parts of the southeastern coastlines of the United States by today. "These swells are likely to cause life-threatening surf and rip current condition," Lang said Thursday. But he also noted: "There is still some uncertainty in the forecast track."